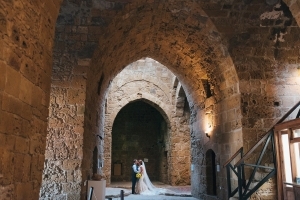 Our Wonderful Paphos Castle Wedding Day. We have now arrived back home in rainy Northern Ireland Andy my husband and I wanted to let you know how that thankful we are for all that you did for is before and on our big day. We both knew as soon as we got engaged on 02 Jul 2016 that we wanted to get married a year later on the 03 Jul 2017, we didn’t really know where to start. We did some research and a friend of mine had got married in Cyprus a few years early and she told us about Stella Virdi and gave us her email address, so we emailed her to ask for further details. She got back to us very quickly and we immediately got a good feel about her efficiency and personality, and had our castle wedding booked within a few days. Our wedding was very small, just the two of us, and 11 guests and I was slightly concerned that a wedding so small wouldn’t really be her priority, I was so wrong! From the very first correspondence we had with her, she made it clear that our wedding was just as important as a big wedding. All the planning was so easy, we just talked on WhatsApp and we sent her pics of what we wanted and that’s exactly what we got. She gave us great advice on everything we needed to do in advance of the big day, including a sample affidavit which we just needed to print and get signed by our solicitor. 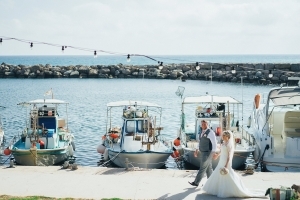 She arranged to pick us up from our hotel in Paphos to go to the town hall to get all our paper work in order a week before the wedding and it all went incredibly smoothly – we were in and out within minutes! She took us to our venue and the restaurant to go through all the details. On the big day, she had arranged for Maria who was amazing, (and had done my nails for me the day before) to come and do my hair and make up as well as my bridesmaid (my 11 year old daughter) and 4 other guests. Stella personally brought the flowers we had chosen to us and she helped to get me in to my dress which was a wonderful help. She helped to dress my youngest daughter who cried at every dress fitting but Stella kept her at ease and also did her hair for me. Sherie. (Stella’s daughter) did all the décor in the castle and it looked amazing and she also set up the restaurant tables which also looked amazing. She arranged for a great photographer Andrzej who photographed me getting into my dress and the ceremony and then took his time talking photos inside the castle and outside, he also did some sunset pics which he took the 2 of us away in his car where it was quite and peaceful and it was all about the 2 of us which was lovely. There are no words to describe just how grateful we are, I can tell you right now that it’s not going to fit into a card! From the moment we met to the day that we left…………..You were the best decision we made in our whole wedding process, we really did have the best day of our lives and we will treasure it forever. For two people who very much knew what they wanted you were extremely understanding and amazing in your communications. Thank you for the never ending emails, the laughter and the memories. From the outstanding and spectacular venue, to the photographer, to the most talented person I know – our florist and everyone involved we were blown away by the beauty in every aspect of our day. Stella is so much more than a wedding planner, she is a great person who goes above and beyond on all occasions. Her knowledge, attention to detail, and dedication are just amazing. She is a rarity and a diligent professional, from the little details to the overall picture she made our day absolutely perfect. If anybody is looking for perfection on their wedding day, please contact Stella Virdi. We hope to keep in contact and arrange to have a coffee/large glass of wine when we return to Cyprus next year.